Electronics and technology companies are determined to make wearable tech as indispensable as our smartphones, but the question is — how? One company is marrying fashion and function with the support of one of fashion's top players. 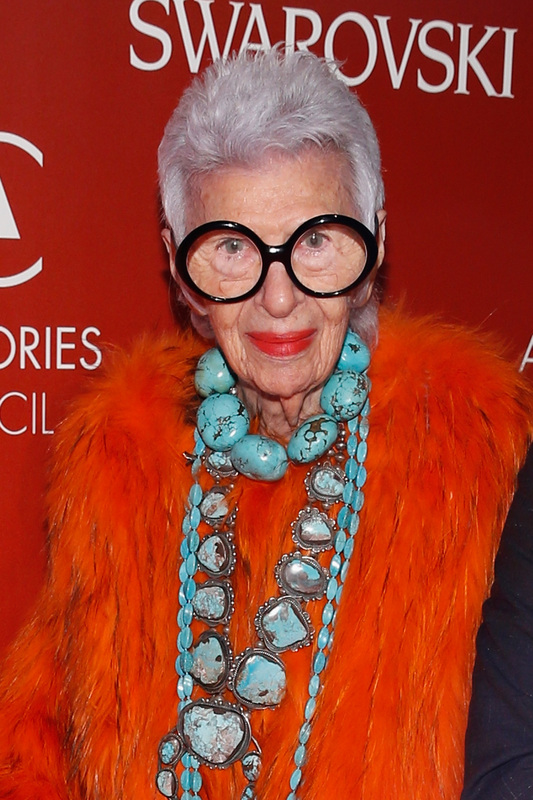 Iris Apfel is teaming up with WiseWear to bring some fashionable wearable tech to the market, InStyle reports. The collaborators are set to release a line of luxury smart bracelets, fittingly titled the Socialite Collection, that fulfill all the requirements users have come to expect of wearable tech — tracking calories, steps taken, and alerting users to incoming calls, texts, and emails — with a few unique additions. Apfel told InStyle that she sees a niche market for wearable tech among older individuals. WiseWear tracks hydration levels, a feature that Apfel, still busy as ever at 94, feels is critical for seniors. "I forget often to drink enough water," she said of the feature, "so I dehydrate and I have had the experience of getting very woozy. I know people who have fallen and have had disastrous results, ranging from a bang in the knee to death." It's not a surprise that WiseWear would sync well to the needs of seniors — founder Jerry Wilmink designed the product with them in mind. Wilmink tells Fast Company that he was prompted to design the product after his grandfather passed away from complications of a broken hip. However, he believes that the product will appeal to another market: young women. "It’s a safety device for women," Wilmink said. "Imagine a woman is at an event and leaves late at night, walks into a dark parking lot, and someone unusual comes up. She can tap the bracelet three times, and it sends a distress message to loved ones with her location. They know exactly where she is." Rather than utilize a touchscreen, WiseWear syncs via Bluetooth to a user's cell phone with the help of an internal antenna. Wilmink claims that the lack of screen makes WiseWear the "first to truly fuse fashion and technology," by giving designers creative freedom. Though WiseWear's Socialite Collection is beautifully designed (what else would we expect from Apfel? ), the company has some kinks to work out. Kaitlyn Tiffany at The Verge points out that the steep price point — $395 — makes WiseWear inaccessible to its target audiences (as a member of the target audience, I can attest to that). Also, as anybody with a stubborn grandmother knows, many elderly people refuse to carry smartphones. WiseWear joins a long list of fashion-forward wearable devices that perform awesome functions for women. Here are just a few. If you already own a FitBit but want to jazz it up a little bit, you can pick up a new silicone skin for just under $40. According to Swarovski's website, the Activity Crystal allows users to track their sleep patterns and miles walked or run. Also, who can resist that much bling? Ray fulfills essentially the same functions as the Swarovski Activity Crystal, but at a slightly lower price point. Like WiseWear, Cuff's products have a built-in emergency alert system, though they lack the health-oriented features that have become associated with wearable tech. Similar to other fitness trackers, the Leaf offers one surprise: it can track your period. This activity tracker alerts you to notifications, tracks calories burned, and records steps taken in a day. If you favor a more sporty look, the Jawbone UP3 looks like it should be on an Olympian's wrist. It also tracks calories, your heartbeat, and the quality of your sleep.